The UBS has something for everyone, and meets the specialised needs of students and academics. We are also experts at sourcing books – so if you’re finding it hard to track something down then we would love to hear from you! Our popular book launches and events celebrate international and New Zealand authors. Our much-loved Children’s Room helps even the littlest booklovers discover the magic of reading. We host a free story-time on The Magic Carpet every Friday at 10.30am and 3.30pm, and Saturday at 10.30am. Keep an eye out for our Bedtime Capers events at the end of the school terms. Textbooks are an important part of what we do, resulting in some unbeatable collections covering Medicine, Dentistry and Pharmacy, the Sciences, Law, Commerce and the Humanities. Our range of books includes contemporary literature and non-fiction, new releases, popular science, and the great works of literature. Our children’s and young adult sections continue to grow and we’re widely known for our leisure and lifestyle books including cook books, interior design, architecture, music and film (among many others!). 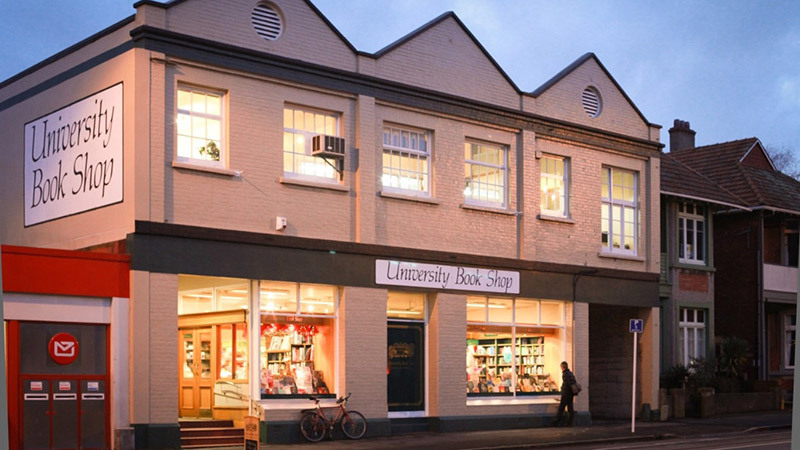 University Book Shop: one of New Zealand’s oldest and largest independent bookshops, and proud to be a part of Dunedin’s special UNESCO City of Literature status.